How do they do that? is a series for The Source that explores the technology that helps keep Metro running and passengers and other commuters moving. Some of it applies directly to the trains, buses and freeways and some of it runs in the background — invisible to nearly everyone but essential to mobility in our region. How does Metro detour buses to avoid unplanned traffic snarls? Unlike yesterday’s advance-planned bus detours around the Academy Awards at Hollywood and Highland, adjusting bus routes on the fly to avoid traffic snarls or police activity can be tricky business. Where’s the snarl? What’s the cause? How long is the snarl expected to remain? How do you let the public know the bus stop has been moved one block south because the street where it normally sits is shut down? It’s all part of life for Metro’s bus operations team that plans routes, watches traffic and follows every single bus in operation 24/7. Is there ever a day when all 2,000 buses run without interruption and on exactly the same routes they are intended? Nope. Last-minute detours occur daily, which is not surprising in a 1,400-square-mile transit area like L.A. County. Detours can be the result of police activity, structural fires in areas with a concentration of bus lines (Hollywood Boulevard or downtown L.A., for examples) traffic accidents or unannounced street closures for weather-related problems, such as flooding. Changes can be to avoid dangerous situations — such as the L.A. riots or the Northridge earthquake. Major detours — the kinds that make the evening news — happen only occasionally. For example, during a Presidential visit in August, 2010, the Westside was jammed for hours as the motorcade made its way through the streets. Although there was advance knowledge of that visit, the exact route was kept secret as a security precaution. Since that time, Presidential visits have relied on helicopters to hopscotch from LAX to destinations, to try to help avoid a recurrence. 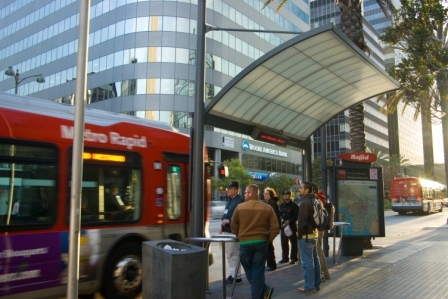 Traffic problems that can stall bus service can be reported by a variety of sources, including LAPD, L.A. County Sheriffs or, as is true 99 percent of the time, by a bus operator on the scene. The source reports the issue to Bus Operations Control (BOC) at Metro headquarters in downtown Los Angeles, which sends out vehicle operations supervisors to the affected area. They devise the optimal detour on the spot, based on safety and efforts to minimize passenger inconvenience. As soon as the supervisors report back with the new routing, Bus Operations sends out a text message with the detour route and duration of the change, if known, to all affected lines. A Code 1 radio broadcast (general alert) with the same information follows. Vehicle operations supervisors may stay on the scene until the problem is resolved and the detours can be shut down or changed to be more effective … even if the issue takes hours to resolve. The other piece of the puzzle — getting the word out to the public — can be a challenge. Announcements are made on Twitter (@metroLAalerts and @metrolosangeles), The Source on metro.net and, occasionally, on City News Service, which is monitored by Los Angeles media. “Stop Moved” signs may be posted at bus stops. Or operations supervisors at the scene can verbally convey the changes. When the need for the detour subsides the vehicle operations supervisors report back to BOC, which cancels the detour and notifies the operators through text and Code 1 radio broadcasts. And everything returns to normal, or as normal as is possible on the streets of L.A. Categories: How do they do that? Funny, I also have wondered “how’d they do this!” I’ve had a good and a bad experience in rerouting, both 704 eastbound to Vermont/Santa Monica Blvd. The good one was an awesome sensation of coolness to see our driver divert down a street and bypass major flooding on Western, dropping us off right at the the Metro station (although feeling sorry for the waiting passengers just east of Western). The bad experience was feeling sorry for the driver who had inadequate information, making various lefts/rights in neighborhood streets, and pulling over to get better guidance from a supervisor. Us impatient passengers were all pissed off that our driver didn’t know where to go. Lesson here? Don’t divert until you know where you’re going!